A good mentor is a gift from the Universe. If you find one, do everything you can to convince them that it is worth their while to mentor you. I am fortunate to be on both sides of the table almost on a weekly basis -- meaning I have awesome mentors that inspire me and hold me accountable and I also happen to have awesome mentees who are enthusiastic about learning and are like my extended family. In general, the basic mode of mentoring is having meaningful conversations that will move the needle in areas of your life or business that matter most to you. A conversation that moves the needle is "effectuation in action." It is one that makes the most of your strengths, factoring in your current constraints and creates a set of possibilities that will show you how to make meaningful progress in a reasonable amount of time. A good mentor goes beyond to change his or her agenda and strive to make you a better YOU. Such a mentor is committed to your growth journey through the ups and downs you experience, and entering and navigating you out of your "comfort zone" to make something extraordinary happen. As they say, "if you are doing what you have been doing, you will continue to get the results you have got." There are exceptions to this rule, but that's outside the scope of what we are discussing here. There is a reason why you continue to do what you are doing even when it may not be producing the results you are expecting in your life or business. These less-than-effective activities may have become 'dragging' habits. Whatever the reasons may be, it is not too late to change course. As Charles Duhigg says in his landmark book, "The Power of Habit," the three elements of creating a habit are cue, routine and reward. A cue triggers an almost automatic routine that is producing a reward as a result of you engaging in the activity. So, to a start a new and better habit, you need to start with a different cue - something that you may not be aware of. A pre-cursor to that is for you to generate the curiosity to look at the same things that you are exposed to today with a different set of eyes. A good mentor opens up the doors to curiosity so that you get back that childlike enthusiasm to learn and grow. Clarity is the side-effect of a good mentoring relationship. Think about it - you are very close to your life/business so it is hard for you to get a "helicopter view" of the same. 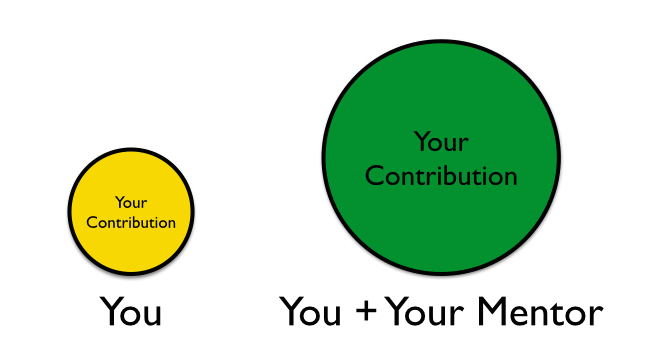 In a good mentoring relationship, this comes automatically as your mentor is someone who cares about your life and business and by default has a "helicopter view" of both of them. The conversations automatically help you discover the "forest for the trees" - thus bringing clarity to your goals and actions. Power from a philosophical perspective is the "capacity to take action to produce meaningful results." You increase your capacity and you can produce better and bigger results in the same amount of time. Sometimes it's a small shift in the way you are thinking that will put your capacity into high gear. Your mentor can unlock that untapped capacity which you can put to work to accelerate your success rate. A good way to know this is if at the end of a conversation with your mentor, you begin to find some things that seemed "impossible" seem totally "possible." Confidence will empower you and will give you the motivation to take the right actions. Sometimes what might be preventing you from taking those right actions (even when you know you should) are the limiting beliefs you have about yourself and the lack of confidence in pulling something off. A good mentor may not give you strength, but helps you discover your hidden strengths and help you move beyond your limiting beliefs. "A good mentor believes in you lot more than you believe in yourself, and becomes your champion," says Dr. Ravi Gundlapalli, a global thought-leader in mentoring and CEO of MentorCloud. The right connections for you at the right time can instantly open new doors, expand your capacity and give you credibility by association. A good mentor thoughtfully connects you to the right people via his or her network. It is important that you grow and earn that right to deserve such introductions. Navigating out of your comfort zone is never easy and fun. Logically, there is discomfort on that path that generally creates resistance tempting you to go back to the "tried and tested" approaches. A good mentor can not only help you choose among the available options at hand, he or she can teach you how to choreograph the sequence of steps so that you get maximum leverage. In a good mentoring relationship, a mentor and mentee celebrate their relationship, the mini, micro and macro victories that they co-create together as they build a relationship that steers your life journey in a compelling way. Last, but not the least, good mentoring relationship is a two-way street and both of you are co-creating your future. Mentor benefits too by being there and watching you grow in your journey. "Teach someone if you want to know how much you have learned. Mentor someone if you want to know how valuable you are to those around you." Good Mentors are those that enjoy being of immense value to others and seeing good things happen to those they care about.